This is our in-depth review of NatureCare AF Antifungal Cream. This naturally made anti-fungal cream claims to treat fungal infections not in weeks but in mere days. It uses a homeopathic treatment and only utilizes 100% natural ingredients to combat the infection in a quick and effective manner. If you wish to learn more about this anti-fungal product, please continue reading our detailed review below. The recommended use of this anti-fungal cream is pretty standard. Simply clean the affected area thoroughly with lukewarm water and soap, dry it off completely and apply the ointment 1 to 3 times per day or as needed. Remember to change your socks daily and keep your feet dry and clean throughout the day. Using foot powders can help alleviate symptoms and further speed up the treatment process. While the NatureCare AF Antifungal Cream uses a combination of relatively safe ingredients, it is important to keep in mind that not everyone will have the same reaction to these compounds. There is a chance of side effects occurring. Possible side effects include itching, redness and a burning sensation. If any of these symptoms develop after the application of the ointment, discontinue use and consult your doctor for an alternative treatment. 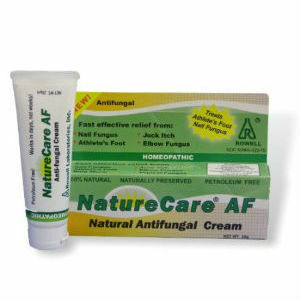 The NatureCare AF Antifungal Cream product is currently available for the price of $11.93 per 25 gram tube. This will usually last a month if you use it 3 times a day, as instructed on the box. It is available both in reputable online stores as well as in most local drugstores. If you wish to use this product immediately then it is recommended that you purchase one in your local drugstore as online shipping might take a few days to a week to arrive. The official website does not post any sort of guarantee for the use of this product and there appears to be no refund available for those who find this anti-fungal treatment ineffective. This could cause some hesitation for first-time customers. To further ensure your safety, please check with your doctor about using this product to get a more informed opinion from a professional. The NatureCare AF Anti-fungal Cream is one of the more affordable anti-fungal treatments available today. It also uses a group of compounds that are considered quite safe and effective in treating fungal infections. However, it should be noted that it does not offer the quick treatment that it claims. There are also several complaints about it not only being ineffective but even caused the infection to worsen. Jimmy Rodriguez	reviewed NatureCare AF Anti-fungal Cream	on November 19th	 and gave it a rating of 2.5.